Online Activism has played a crucial role in raising awareness for social and political change. It allows for a faster method of communicating and arranging peaceful protests. This type of activism has ultimately led to the replacement of long-standing dictatorships during the Arab Spring and across the Middle East. Governments often impose crackdowns of social media activists and are known to restrict internet access as a means to deter organized public action. As digital media advances, there is a growing need for younger revolutionaries and activists to push for democracy through journalism and by joining peaceful protests. CESD recognizes the role that young activists play in their contribution to advocacy. When CESD was founded, we hosted youth development programs, in collaboration with groups such as EuroMed Youth. From 2004 to 2009, our organization sent more than 60 members from Syria to European and MENA countries for youth exchange programs. 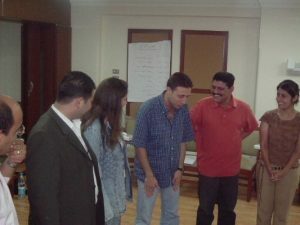 We provided training for youth journalists and citizen journalists in Syria, Egypt, Morocco, Jordan, and Lebanon. Students were accommodated with housing near Syrian Universities on behalf of CESD. Those very same students went on to become influential figures and role models during the Arab Spring across the Middle East, and they continue to report on humanitarian crisis issues. We have organized training sessions regarding women’s rights, roles in society and politics, and held seminars on CEDAW (The Convention on the Elimination of all Forms of Discrimination Against Women) for Iraqi, Jordanian, Lebanese, Saudi, Bahranian, Egyptian, and Sudanese women. A growing number of ethnic and tribal conflicts have contributed to internal chaos across the Middle East. Ethnographic and demographic studies are helpful in determining a background for these conflicts. CESD focuses on the ideologies and structure of many ethnic groups in the MENA region, including Assyrian’s, Ashuri’s, and Quqazi’s. We are the first non-profit organization to produce stories about IDP’s in Syria, and specific minority groups in northeastern Syria. In 2004, we also covered the Kurdish Revolution that was held against the Assad regime. The establishment of safe-zones, or ‘de-escalation zones’ in Syria will protect thousands of civilians and contribute to the rebuilding process. CESD’s goal is to support peaceful initiatives on the ground inside Syria. In August of 2015, we wrote ‘The Syrian Homeland Initiative for All’, which argued potential options for achieving the end of hostilities. We sent the report to the United Nations and various governmental organizations. In 2016, we promoted the concept of a safe-zone in Syria, through videos and stories from activists who share our solution. We provided a Trump Campaign Advisor with our report on the benefits of a safe-zone in southern Syria. Our training programs have taught valuable skills to more than 500 journalists and citizen journalists across Syria, Jordan, Egypt, Lebanon, Saudi Arabia, Yemen, Bahrain, Sudan, Morocco, and Algeria. Our trainees capitalized on the experience and were able to build new projects in many countries. We remain in contact with our trainees, who have gone on to work in the fields of media and non-profit development. We currently guide citizen journalists through the implementation of digital media tools, improved storytelling, and data-driven findings. We assist journalists in the US and Europe to establish contacts and provide sensitive information to representatives within the MENA Region. We also work with students who are enrolled in journalism schools across the US and conduct research on terrorist groups, refugees, migration, and democracy in the Arab world.